VERA CHINESE PHOTO Congressman Lee Zeldin speaks to reporters and concerned members of the public at a press conference on helicopter noise at Southold Town Hall in March 2015. JULIE LANE PHOTO | Senator Kirsten Gillibrand at the Little Ram Island home of Tom Rausch and Katie Ford. 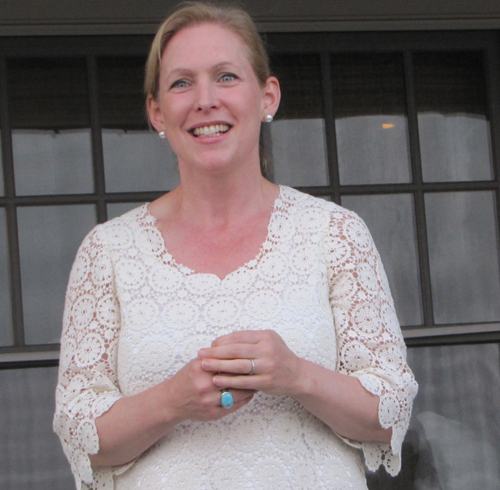 Senator Kirsten Gillibrand came to Shelter Island Friday night to raise funds both for her own re-election campaign and to support other Democratic candidates, especially women in tight races in their home states, she said. Ms. Gillibrand, 45, is seeking her second full term in the U.S. Senate. A former Congresswoman from upstate New York, Ms. Gillibrand was first appointed to the Senate to replace Secretary of State Hillary Rodham Clinton in 2009. She will be opposed by Republican candidate Wendy Long this November. The fundraiser was held at the Little Ram Island home of Tom Rausch and Katie Ford.